After weeks and weeks of rollovers, the $310.5 million Powerball jackpot finally fell on 30 September. The winner just came forward and we here at us-powerball.com have all the details on this amazing lottery millionaire. Leach is now rich indeed and she instantly quit her job upon confirming her jackpot win. She and Vaughn Avery, her boyfriend of 36 years, are going to use the money for a fabulous early retirement and to help out their family. She and Avery have been together since they were in high school and it looks like their lifetime commitment to each other is paying off in more ways than one. While they never got officially married, both quit their jobs and plan to live happily ever after — though Leach joked about Avery having to sign a pre-nup. 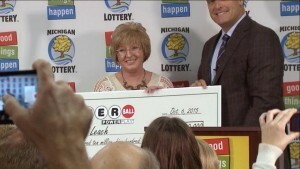 Leach is Michigan’s second largest lottery winner. Donald Lawson takes the first place with a $337 million Powerball jackpot he won on 15 August 2002. The winning ticket was sold at a local gas station in Three Rivers and will get a commission from the lottery. 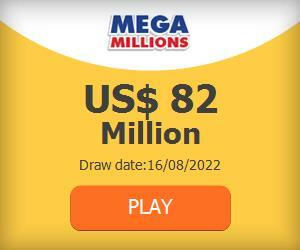 The 30 September winning numbers were 21, 39, 40, 55, 50 and Powerball 17. The current Powerball jackpot is worth $50 million. Buy your tickets today for your chance to become the next big Powerball winner. Whether you reside in Alaska or Australia, you can participate by purchasing your Powerball tickets online. Click the Play Now button on this page to get a chance at making your wishes come true.